Poker is usually a cut-throat game that involves lying, gambling, and occasionally cheating. InnovaPoker uses the negative aspects of the game, in a positive way, engaging users, building teams, and empowering them with advanced innovation techniques. Data analysis provides management with a wealth of tangible insights. 1. Organizations throughout the world are losing billions of dollars annually due to employees playing games during work. These are usually mindless games that can help speed the day along. When this is the case, the organization loses twice because they have a disengaged employee providing absolutely no value to management. This will continue because with BYOD every employee has their favorite game on their phone. Employees need something engaging and productive to minimize this loss. 2. It is difficult to hire qualified employees with excellent analytical skills. Many hours are wasted interviewing bad candidates. Some performance analyzers can be hacked, so organizations need a tried and true way to cheaply test the level of analytical thinking of applicant. 3. It can be extremely difficult to get cross-functional communications between 2 employees rather than a whole group. A channel needs to opened so cross-functional groups can be created and disbanded at will. These groups will have to get comfortable with each other fast and be able to help group members learn new concepts easily. The framework of the game can have many different implementations and is limited only by the imagination. 1. The organization would implement a daily 20 minute poker session as part of its culture. This would be minimally 2 rounds of play. In the beginning of each round, a question about innovation or productivity is asked. The group then will rank the answers and work as a group to beat the computer players. The players with the most points and selected ideas and innovations get rewarded growing the acceptance of the program. During and after gameplay, the data derived will be analyzed using SAP HANA providing management with a wealth of information about the organization's most precious resource. 2. The organization would add InnovaPoker's API directly to its application website. Before the potential applicants submit they will be required to play a couple rounds of single personal InnovaPoker. They will be judged on their answer and by the way the handle situations during the rounds. This data will be analyzed and compared against a predetermined acceptance score, poker statistics, and game theory techniques. The information presented will tell how well the applicant can think logically. 3. Allowing the borderless communication of business ideas working as cross-functional teams would be as easy as joining a table. The teams naturally get comfortable through the gameplay. The best leaders and team builders in the organization will show they can help. Even if only 1 InnovaPoker game is played, both the employee and the company are happy. The novel way that poker is integrated with innovation enables employees to have a break from work, while working on a team! Employees are able to turn a disengaging activity into one that engages them with the business. In his book Thinking, Fast and Slow, Daniel Kahneman shows that the system involved with higher thinking is normally lazy. InnovaPoker subliminally forces the players think analytically, engaging them to think and act differently than without gameplay. The fact that not everyone is a pro poker works in team building, since players are required to help of team mates. On a major implementation, it becomes everyone's favorite game. Attitudes will be improved as the employees feel they can make innovative contributions and are rewarded. New employees can meet people in the company that they might have never met. It makes the day a little easier to get through even if it is work disguised as fun. Furthermore, it enables channels of communication that might be blocked off otherwise due to politics, boarders, walls, etc. This can be implemented on multiple levels enabling organizations to start small and grow large or only have a one-time demonstration at their company retreat. It will be accessible through a standard web browser so implementation will be pretty straightforward. InnovaPoker was created by Joshua Richard Craig Helton. It is property of Nebulae1, a consulting and development firm located in Cincinnati, Ohio. 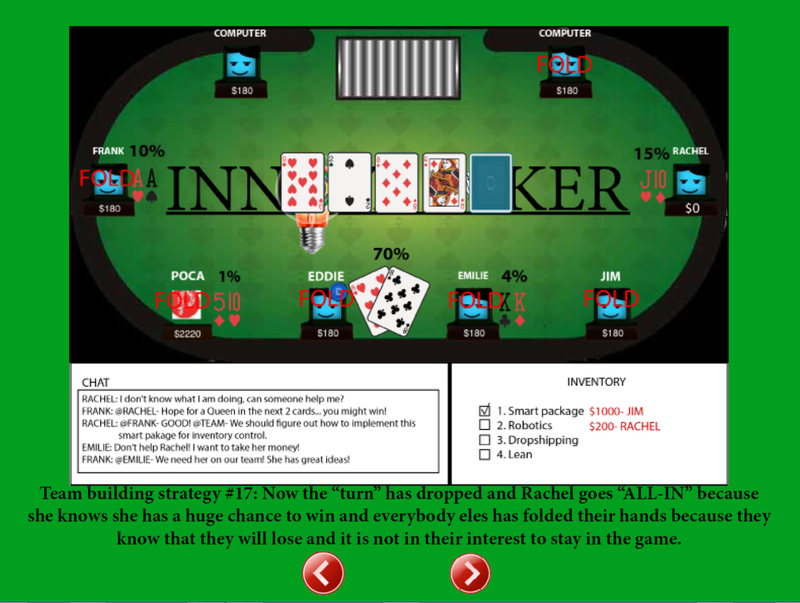 InnovaPoker is currently in its developmental stages. Please email info@innovapoker.com for more information. Daniel Kahneman (25 October 2011). Thinking, Fast and Slow. Macmillan. ISBN 978-1-4299-6935-2. Great Idea Joshua. I can clearly see it helps build team culture, help recruitment but why only poker, not everyone is a fan of poker. I could see this being extremely valuable and game changing!